For other people named George Bradley, see George Bradley (disambiguation). George Washington Bradley (July 13, 1852 – October 2, 1931), nicknamed "Grin", was an American Major League Baseball player who was a pitcher and infielder. He was 5'10.5" and weighed 175 lbs. Bradley threw the first official no-hit, no-run game in major league history. He pitched for the St. Louis Brown Stockings in the club's victory over the Hartford Dark Blues on July 15, 1876. The score ended 2-0 without a hit being allowed by Bradley. That year, he completed 63 of St. Louis' 64 games, winning 45 and leading the league with a 1.23 earned run average. He also threw 16 shutouts, setting a record that has not been broken. After 1876, Bradley was not as effective as a pitcher and played mostly other positions after 1879. He was involved in professional baseball for 30 years, 19 of them with the Philadelphia Athletics. In 1883, he was the team's regular third baseman and also went 16-7 on the mound to help the A's win the American Association championship. 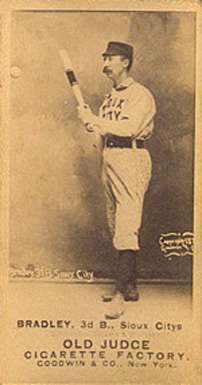 In 1887, he served as a player-manager for the Nashville Blues of the Southern League. Bradley became a Philadelphia police officer following his baseball career. He died in Philadelphia at his home. At the time of his death, he was retired on a pension from the police department which he had received beginning in September 1931. Bradley was interred at the Northwood Cemetery in Philadelphia. 1 2 3 "George Bradley Stats". Baseball-Almanac.com. Retrieved 2006-11-20. 1 2 Ivor-Campbell, Fred. "George Bradley". BaseballLibrary.com. Retrieved 2010-10-22. ↑ "1883 Philadelphia Athletics". baseball-reference.com. Retrieved 2010-10-22. ↑ Traughber, Bill. "Looking Back: Nashville Blues." Nashville Sounds. April 26, 2004. Retrieved on March 22, 2008.